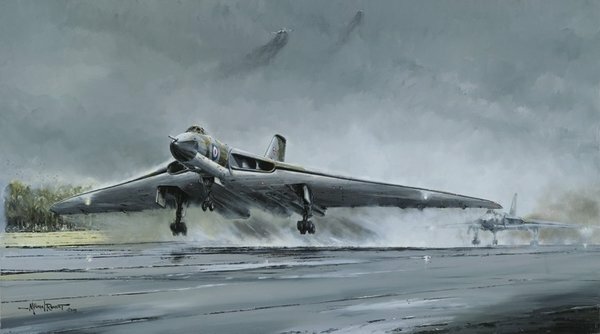 The Avro Vulcan V-Bomber stream take-off was a powerful image of the Cold War years. As part of the V-Force, the Avro Vulcan was the backbone of the UK's airborne nuclear deterrent. The scramble was a hugely noisy and spectacular event which was regularly practiced during the Cold War, bringing the whole of the area around the airfield to a standstill. Those who witnessed it will still remember the fantastic and spectacular display of power. The edition is limited to 350 signed and numbered copies. Artist's proofs have an original pencil drawing of a squadron badge added to the print border. Remarque copies have a detailed drawing of a Vulcan added to the print border.